Growth slows in emerging markets like Brazil, China, Turkey, and Argentina. What gives? What if the Emerging Markets Aren’t? Growth has slowed in the BRICS, Turkey, and other countries. What does that mean? 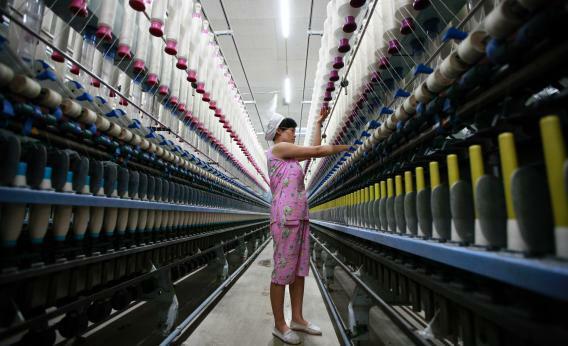 A laborer is seen working in a textile factory in Huaibei, in north China’s Anhui province on July 24, 2013. China’s manufacturing activity contracted to a 11-month low in July. During the last few years, a lot of hype has been heaped on the BRICS (Brazil, Russia, India, China, and South Africa). With their large populations and rapid growth, these countries, so the argument goes, will soon become some of the largest economies in the world—and, in the case of China, the largest of all by as early as 2020. But the BRICS, as well as many other emerging-market economies—have recently experienced a sharp economic slowdown. So, is the honeymoon over? Brazil’s GDP grew by only 1 percent last year, and may not grow by more than 2 percent this year, with its potential growth barely above 3 percent. Russia’s economy may grow by barely 2 percent this year, with potential growth also at around 3 percent, despite oil prices being around $100 a barrel. India had a couple of years of strong growth recently (11.2 percent in 2010 and 7.7 percent in 2011) but slowed to 4 percent in 2012. China’s economy grew by 10 percent per year for the last three decades, but slowed to 7.8 percent last year and risks a hard landing. And South Africa grew by only 2.5 percent last year and may not grow faster than 2 percent this year. Many other previously fast-growing emerging-market economies—for example, Turkey, Argentina, Poland, Hungary, and many in Central and Eastern Europe—are experiencing a similar slowdown. So, what is ailing the BRICS and other emerging markets? First, most emerging-market economies were overheating in 2010-2011, with growth above potential and inflation rising and exceeding targets. Many of them thus tightened monetary policy in 2011, with consequences for growth in 2012 that have carried over into this year. Second, the idea that emerging-market economies could fully decouple from economic weakness in advanced economies was far-fetched: recession in the eurozone, near-recession in the United Kingdom and Japan in 2011-2012, and slow economic growth in the United States were always likely to affect emerging-market performance negatively—via trade, financial links, and investor confidence. For example, the ongoing eurozone downturn has hurt Turkey and emerging-market economies in Central and Eastern Europe, owing to trade links. Third, most BRICS and a few other emerging markets have moved toward a variant of state capitalism. This implies a slowdown in reforms that increase the private sector’s productivity and economic share, together with a greater economic role for state-owned enterprises (and for state-owned banks in the allocation of credit and savings), as well as resource nationalism, trade protectionism, import-substitution industrialization policies, and imposition of capital controls. This approach may have worked at earlier stages of development and when the global financial crisis caused private spending to fall; but it is now distorting economic activity and depressing potential growth. Indeed, China’s slowdown reflects an economic model that is, as former Premier Wen Jiabao put it, “unstable, unbalanced, uncoordinated, and unsustainable,” and that now is adversely affecting growth in emerging Asia and in commodity-exporting emerging markets from Asia to Latin America and Africa. The risk that China will experience a hard landing in the next two years may further hurt many emerging economies. Fourth, the commodity super-cycle that helped Brazil, Russia, South Africa, and many other commodity-exporting emerging markets may be over. Indeed, a boom would be difficult to sustain, given China’s slowdown, higher investment in energy-saving technologies, less emphasis on capital- and resource-oriented growth models around the world, and the delayed increase in supply that high prices induced. The fifth, and most recent, factor is the U.S. Federal Reserve’s signals that it might end its policy of quantitative easing earlier than expected, and its hints of an eventual exit from zero interest rates, both of which have caused turbulence in emerging economies’ financial markets. Even before the Fed’s signals, emerging-market equities and commodities had underperformed this year, owing to China’s slowdown. Since then, emerging-market currencies and fixed-income securities (government and corporate bonds) have taken a hit. The era of cheap or zero-interest money that led to a wall of liquidity chasing high yields and assets—equities, bonds, currencies, and commodities— in emerging markets is drawing to a close. Finally, while many emerging-market economies tend to run current-account surpluses, a growing number of them—including Turkey, South Africa, Brazil, and India—are running deficits. And these deficits are now being financed in riskier ways: more debt than equity; more short-term debt than long-term debt; more foreign-currency debt than local-currency debt; and more financing from fickle cross-border interbank flows. These countries share other weaknesses as well: excessive fiscal deficits, above-target inflation, and stability risk (reflected not only in the recent political turmoil in Brazil and Turkey, but also in South Africa’s labor strife and India’s political and electoral uncertainties). The need to finance the external deficit and to avoid excessive depreciation (and even higher inflation) calls for raising policy rates or keeping them on hold at high levels. But monetary tightening would weaken already-slow growth. Thus, emerging economies with large twin deficits and other macroeconomic fragilities may experience further downward pressure on their financial markets and growth rates. These factors explain why growth in most BRICS and many other emerging markets has slowed sharply. Some factors are cyclical, but others—state capitalism, the risk of a hard landing in China, the end of the commodity super-cycle—are more structural. Thus, many emerging markets’ growth rates in the next decade may be lower than in the last—as may the outsize returns that investors realized from these economies’ financial assets (currencies, equities, bonds, and commodities). Of course, some of the better-managed emerging-market economies will continue to experience rapid growth and asset outperformance. But many of the BRICS, along with some other emerging economies, may hit a thick wall, with growth and financial markets taking a serious beating.